Busy Bees is back in business after a week off because of the Ryder Cup. Lovely to see everyone again and looking forward to all the workshops & courses that we have coming up. Our new 2011 calendar is now on sale. It's full of lots of lovely photos of our customers and groups. Sue and I are really pleased. Thank you to Tom for all his hard work, getting it together and to Chris Westwood for taking so many lovely photos. 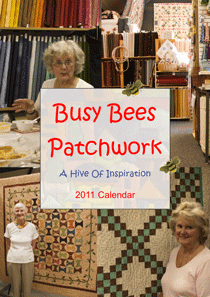 The calendars are £6.50 each and would make a great Christmas present for family and quilting friends.